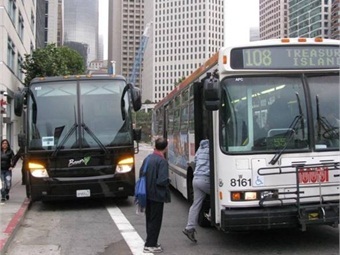 The San Francisco Municipal Transportation Authority (SFMTA) approved enhanced regulations for commuter shuttles that will restrict larger shuttle buses from smaller streets, require greener fleets to reduce emissions and put in place rules to prevent labor disruptions. The new regulations create an ongoing program that builds off an 18-month pilot program set to expire at the end of January 2016. Under the ongoing program, the fee charged to shuttle operators will increase to pay for stepped-up enforcement. The higher fee will also help cover the cost of street improvements like boarding islands and sidewalk bulbs that will also improve Muni performance and enhance pedestrian safety. Under state law, the fee is limited to the cost of running the program. The updated amount will depend on a number of factors, but it will be higher than the $2.4 million per year collected from shuttle companies under the pilot program. 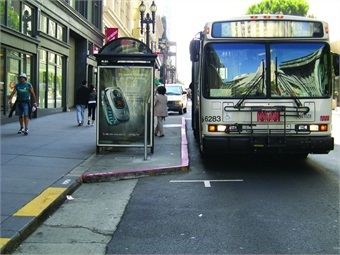 In January 2014 the SFMTA Board of Directors approved an 18-month Commuter Shuttle Pilot Program to regulate and better understand the hundreds of commuter shuttles using the city’s streets to take people to work or school either in San Francisco or to Peninsula and South Bay destinations. 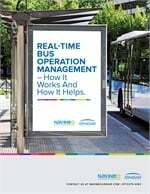 The voluntary program included charging private shuttles to stop in Muni bus zones, concentrated enforcement and extensive data collection on the frequency and location of shuttle loadings. Under the new regulations, which take effect February 1, 2016, commuter shuttles over 35 feet long must stay on Caltrans arterial street network. All shuttle vehicles not already approved for use in the pilot as of January 31, 2016 must be either model year 2012 or newer, or be equipped with a power source that complies with emissions standards applicable to the 2012 class of vehicle. As of January 1, 2020, all shuttle vehicles used in the program must be model year 2012 or newer. After 2020, all shuttle vehicles must be no more than 8 years old. Shutt le operators must also comply with the San Francisco Board of Supervisors’ March 2015 Labor Harmony Resolution, including the submission of a Service Disruption Prevention Plan that describes the shuttle operators’ efforts to ensure efficient and consistent service in the event of potential disruptions, including labor disputes. The new regulations also require increased data sharing from participating shuttle operators to better understand where their vehicles are operating and assist in enforcement. An analysis of the pilot program found that conflicts with Muni buses were reduced by about 35% on a per-stop basis, and the number of commuter shuttle stop locations were halved from about 250 before the pilot to 124 during the pilot. If the shuttles are not an option, nearly half (47%) of survey respondents said they would drive alone to work. That would translate to almost 8,000 more one-way car trips a day, the equivalent of every car that uses 24th Street daily. That’s more than 2 million one-way car trips a year on what are already congested streets. By taking cars off the road, shuttles remove nearly 4.3 million vehicle miles traveled from the streets each monthWith limited exceptions, shuttles are free to use San Francisco’s streets regardless of an SFMTA regulatory program. The agency’s regulatory efforts are an evolving process that has and will continue to take into account community concerns. With limited exceptions, shuttles are free to use San Francisco’s streets regardless of an SFMTA regulatory program. The agency’s regulatory efforts are an evolving process that has and will continue to take into account community concerns.